We are in a pretty major technology boom at the moment. One that will likely make the industrial revolution look tiny. And one of these technologies that are building up to lead the way is something called augmented reality. There is a chance you've heard the phrase thrown around last summer during the Pokémon GO craze or have used some Snapchat picture filters — both of which are uses of the technology. You probably know what augmenting something means, and hopefully, you have some kind of grasp on reality. Now learn what they mean when they are put together. This series is designed to be a beginners guide to all things augmented reality. In this first part, we will cover many of the common terms that are used daily when talking about the tech. We will follow this up with a look at the companies and current options that exist right now, as well as a few that should be out soon. On the most basic level, augmented reality, a technology that has been around for 40 years in some form, is a visual technology that superimposes computer-generated images on the user's view of the real world. This can be in a more traditional heads-up display style to provide information like directions or notification of messages. Or it can also be what has become increasingly more popular in recent years thanks to tracking technology such as inertial measuring units or Microsoft's inside-out tracking — the ability to give this technology presence in our world by superimposing graphics that actually behave as though they are in the world. 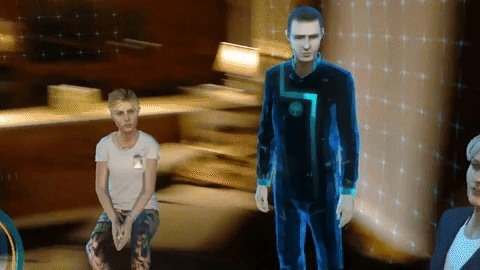 What makes the presence of these computer-generated graphics believable is the fact that if you have a holographic character sitting on your couch as pictured above, from the Microsoft HoloLens game Fragments, moving the view around does not disturb the positioning of the characters. They will continue to sit on the couch. This is due to the previously mentioned tracking systems on the various devices. Handheld: This segment is made up of smartphones and tablets, which in most cases have some capacity for producing believable images. Head-worn: Comprised of smartglasses, visors, and helmet-type devices with built-in optical projection systems that produce a far more convincing experience — but at an exorbitant cost in this stage. While the wider potential install base is the handheld market currently, with billions of users currently, the head-worn category is a far more complete and immersive experience. But at its current price point, it is too expensive for the average consumer to buy into yet. Okay, but What Can It Do? Of course, due to its involvement in the video game realm for so long, any 3D development instantly makes people think of gaming. And while this technology easily lends itself to new forms of entertainment, such as social interactive storytelling or large-scale scavenger-hunt-type applications, we as a society will have to get over the stigma of relating 3D graphics with movies and games. While currently, the jury is still out on what use-cases will really have an effect on the world, one thing is for sure: Regardless of if AR ever becomes the commonplace technology many of us working with it believe it will be — as in everyone walking down the street wearing smartglasses, a complete visual replacement for your smartphone — AR is definitely something that we will be using at work for a long time to come. Research exists showing a 34% productivity increase using the device for the first time with the companies that have adopted the technology — even in the infant state of the current generation of technology. As mentioned, there have been use-cases for this technology for some time, mostly in the military sector, but they were a very different take on the tech. All in all, a 34% increase is massive. If these numbers can be replicated or improved on, as the technology matures, we will begin seeing more and more head-worn devices in all different types of industries. Use-cases will be found to make dangerous jobs safer and difficult jobs easier. There will be many training uses that allow people to gain new skills through step-by-step instructions. The way we work will change drastically. In one form or another, we will begin seeing this technology more and more in the years to come. And if the analysts are correct, it will really start to boom after 2020. Be ready. Next Reality will be here to help you with that. In the next part of this series, we will take a look at many of the specific hardware options that currently exist and a few that may exist this year. Next Reality is a news and tutorial source dedicated to all things augmented reality and we touch on many of its related technologies like artificial intelligence and Internet of Things. Keep your browser pointed here to learn more.